I often talk to people who have a hard time properly racking the bar on their backs for barbell squatting. Sometimes, it is simply a matter of knowing how and where to place the bar on your back. For others, compromised shoulder and thoracic flexibility, often due to a combination of injury and poor posture, make it difficult to get under an empty bar, let alone maintain proper positioning under load. In this article, I’ll suggest a few tips and stretches that might help you get back under the bar and stay there with less discomfort. If you have neck or shoulder girdle issues that go beyond simple inflexibility, and extend into pain and injury, be sure to work with a medical professional to determine if these drills would be appropriate for you and your issues. In the first two pictures (below) of high bar and low bar positioning, notice how inattention to form and/or lack of flexibility has hindered proper back extension even before the lifter has taken the first step out of the racks. You might be thinking, “I can’t get into those proper positions because I’ve been sitting at my computer and in my lazyboy for too long. I’m not Mr. Bendy-Man like you.” Then I’m going to suggest you add the following stretches, drills and exercises to your training diet for a while. Most people are familiar with this drill. Using a dowel, broomstick or PVC, bring the arms overhead into a stretch. If you are flexible enough, you can bring your arms all the way over your body. Take a wide grip and start slowly. As you gain flexibility, you can bring the hands closer, however don’t rush this as because a grip that is too narrow can crank your shoulders and elbows. With this stretch, which can be done on a fireplace mantel or railing just as easily as with a barbell in a rack, a key is to hinge at the hips and keep the chest out while allowing the head to sink between the arms. You should feel a stretch throughout the lats and upper back. Allowing one shoulder to dip will deepen the lat stretch on that side. Turning away from the barbell (or mantel, railing, etc) hands palm down, you should feel a gentle stretch across the pectoral region through the biceps. Move the hands closer and lower your upper body to feel a greater stretch. Bent over laterals and cross bench pullovers are two exercises that you rarely see performed in gyms these days, but are excellent for building and maintaining upper body suppleness. Add them to your routine. There’s no need to go heavy on them – these should not be “ego-exercises.” Most people would be fine starting with a pair of 5-20lb dumbbells for their bent-over laterals, and a 10-20lb dumbbell on their cross-bench pullovers. Focus on getting a full range of motion. 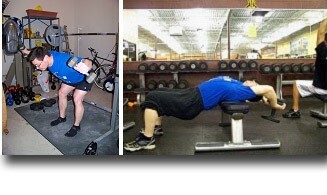 Build into them, gradually adding range of motion and weight. Bracing the forearm against a door (or power rack) frame, stick your chest out (remember “proud chest”), draw your shoulder blades together and lean forward to feel a stretch across the pectoral and anterior delt region. You can do this unilaterally, or both arms at once. Vary the height of the elbow relative to the upper body to shift emphasis of the stretch. 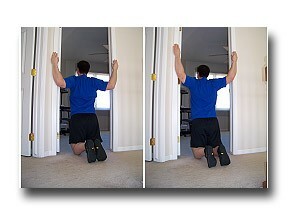 With a foam roller, you can do stretching positions as shown in the pictures above. Do as tolerated and position yourself by pulling or pushing your body forward and backward with the legs over the roller. A small cushion for your head and neck can be added if the positions cause discomfort. The following are a few drills ‘borrowed’ from Jumpstretch that I found personally very helpful for back pain. Some of them may be useful for you to – understand that the traction provided by bands in this manner could aggravate certain conditions, so If there are concerns, please consult with a medical professional before attempting. 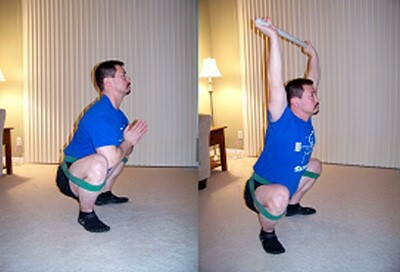 Begin by wrapping the band around the back and onto one knee—give yourself more slack for the first knee. Getting the second loop around the other knee will be harder if you are taller or bigger. Use a lighter resistance band if this is the case. On all fours, you can do glute and IT band stretches and “tactical frog” drills. The bands provide a firm traction for the lumbar and hips region. Butterfly stretches are also a delight wearing bands. 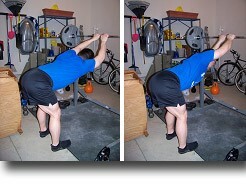 The bottom position of the squat can be grooved with bands worn this way. The pressure of the bands around the knees will pull the hips into external rotation and encourage proper lumbar curvature. Flexibility and limb length will limit who will be able to get into proper position. Build into them. I don’t illustrate it here, but hip thrusts or glute bridges may also be done with bands fitted in this manner to good effect—the bands will serve to strongly engage the glutes and dis-inhibit the hip flexors. One additional thing I found was that wearing the bands in this manner placed my hips and legs in a more comfortable and natural position for seiza. The bands provide traction for the lumbar, open the hips, and help create improved posture in this seated position and encourage greater awareness of the tanden (the diaphragm “power center”). Add the barbell stretches, skin-the-cat, dislocates, light cross-bench dumbbell pullovers and light bent-over laterals to your squat session warm-up. Two or three “sets” of each should suffice and take no more than five minutes total. Seek a light stretch—the goal is to feel better and more comfortable under the bar. When you’re relaxing in front of the television or at home killing time, add the foam roller work, doorway stretches and skin-the-cat drill to your daily routine. Add in band work as required for improved posture and assisted stretches. After incorporating these drills into your warm-ups and daily routine for a couple of weeks, you should feel a marked difference in your ability to maintain proper positioning under the bar.